Year one welcomed Jo Elijah to school to teach them about the Jewish Sabbath. The school choir enjoyed travelling to Birmingham and taking part in Young Voices. They had been practising songs for many weeks and enjoyed singing in an arena and joining in with all the dances that they had also learnt. Key Stage One enjoyed sharing their Christmas Play with two wonderful audiences! We are very proud of one of our Year 6 Pupils who took part in a National Dance Competition in Blackpool. She came third in the country for her Rock and Roll Dance. 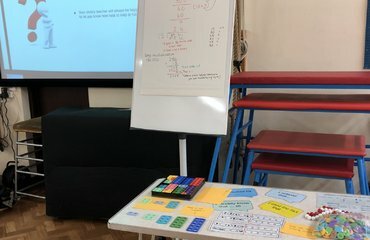 Miss Smith would like to thank all the parents who attended her Key Stage 2 Maths workshop. Details of the information given out during the evening can be found in the Maths section of this website. Elm class have enjoyed den building in the outdoor woodland. They also had a camp fire with toasted marshmallows and chocolate biscuits! Maple Class have had a wonderful start to the new term. Here are some photographs of us enjoying ourselves. Elm Class enjoyed a treasure hunt around the village to support their geography and map drawing skills. Maple Class had a wonderful trip to Rookery Farm. Key Stage 2 children put on a wonderful performance of Alice the Musical. Thank you to everyone who supported the play and came to watch. Maple Class had a lovely day dressed as pirates. We hunted for treasure and invited our families to join us for cakes and songs. The children had a fantastic time on the Isle of Wight. Please find a selection of photographs for you to look at. These photographs are the property of Hanslope School and are not to be copied or shared on any other media platform.